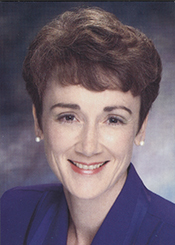 Heather A. Wilson was born on December 30, 1960, in Keene, New Hampshire. During her junior year in Keene High School, the U.S. Air Force Academy began admitting women. Wilson, who hoped to become a pilot, like her father and grandfather, entered the academy and graduated in 1982. She earned a Rhodes Scholarship to study at Oxford University where, by 1985, she earned a master’s and a doctorate in international relations. Wilson served in the Air Force until 1989 when she joined the National Security Council staff as director for European Defense Policy and Arms Control. In 1991, she married lawyer Jay Hone, and the couple settled in New Mexico. They raised three children: Scott, Joshua, and Caitlin. Wilson then started a consulting firm and, from 1995 to 1998, served in the governor’s cabinet as secretary of the New Mexico children, youth and families department. When Wilson took her seat in the House in 1998, she received assignments on the Commerce Committee (later renamed Energy and Commerce), including its subcommittees on Telecommunication, Energy and Air Quality, and Environment and Hazardous Materials. She remained on that panel for the duration of her House career. Wilson also won an additional seat on the Permanent Select Committee on Intelligence. But she left that assignment in the 107th Congress (2001–2003) for a seat on the powerful Armed Services Committee. Armed Services offered her a prime vantage point from which to oversee personnel and infrastructure issues at two installations in her district: Kirtland Air Force Base and the Sandia National Lab. In the 109th Congress, Wilson left Armed Services to return to the Intelligence Committee, where she chaired the Subcommittee on Technical and Tactical Intelligence. Wilson’s reputation in Congress was that of a moderate Republican who was not reluctant to take positions independent of her party. She called for a simplification of the tax codes and became one of the GOP’s point persons in the House to criticize the American bombing campaign in Kosovo. But on social issues, she was more moderate than many of her GOP colleagues. She supported requiring federal workers’ health plans to cover contraceptive coverage (although she opposed using public money to pay for abortions) and also voted down an amendment that would have banned adoptions by gay parents in the District of Columbia. She also opposed a plan by the Republican leadership to move management of the nuclear weapons program (largely based in New Mexico) from the Department of Energy to the Pentagon.5 In 2006, Wilson led efforts to ensure congressional oversight of the President’s terrorist surveillance program. Wilson chose not to seek re–election to a sixth term in the House, and instead announced her intention to run in 2008 for an open U.S. Senate seat being vacated by longtime New Mexico Senator Pete Domenici. Wilson narrowly lost the Republican primary and retired from the House at the conclusion of the 110th Congress on January 3, 2009. 1Several early female Members of Congress served as nurses during World War I. 2John Mercurio, “GOP, Wilson Win in N.M.; Democrats Learn It’s Not Easy Beating Green,” 25 June 1998, Roll Call. 3Rachel Smolkin, “Rep. Wilson Takes Office With a Little Help From 4–Year–Old Son,” 26 June 1998, Albuquerque Tribune: A6. 5Politics in America 2002: (Washington, D.C.: Congressional Quarterly Inc., 2001): 660–661; Almanac of American Politics, 2002 (Washington, D.C.: National Journal Inc., 2001): 1023–1025. Papers: The papers are not yet accessible for research. "Heather A. Wilson" in Women in Congress, 1917-2006. Prepared under the direction of the Committee on House Administration by the Office of History & Preservation, U. S. House of Representatives. Washington: Government Printing Office, 2006. Wilson, Heather A. "International Law and the Use of Force by National Liberation Movements." Ph.D. diss., Oxford University, 1988.